Dunlop RIGGER A442713FL Work Boots - Wellingtons With steel Toe Cap and Midsole. A leather work boot 100% waterproof. S5 CI Toe protection tested to 200 joules impact. Convenient tabs for easy pull on. Durable and hard wearing boot, ideal for general staff. Fur lined version for a snug fit and insulation to -20c cold temperatures. Dunlop Rigger Acifort A442713FL Safety Rigger Boots conforms to: EN345 S5 Safety Footwear Standards. Available in size UK10 only. 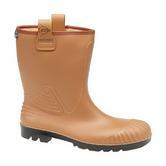 Cofra Typhoon S5 Safety Wellington-Boots with protective toe cap and mid-sole. These are widely used for forestry and agriculture. Their high cleats and the design of the outsole make this boot very stable on the most uneven of grounds. Toe-cap and stress areas are reinforced for greater longevity (also available with inner lining in THERMO-DRY). Cofra Typhoon S5 Safety Wellington compliant with EN ISO 20345 S5 standard. Optimised comfort due to the ergonomic design implemented. Light weight design minimizing users fatigue. Manufactured with a shock absorbent heel. Thermal protection down to as low as -20°C. The fully waterproof Pricemastor Green 380VP plain rubber wellingtons from Dunlop. Practical knee boot ideal for use in agriculture, walking, hunting and leisure. Practical and professional resistant to minerals, vegetable oils and fats boot. Dikimar Primera gardening shoes are made with high quality PVC materials. Self-lining inside protects your feet against the elements. These shoes are lightweight, tough and durable. Practical and flexible this shoe is ideal for gardening activities. Reactive dyed material, knitted collar and cuffs, a taped neck, and side vents with an extended back for added comfort. 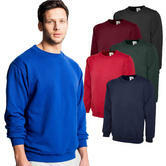 Washable at 60 degrees, and available in a range of the most popular colours and sizes. The Regatta TRA788 Flux Softshell Bodywarmer is a versatile and durable piece of workwear suited from many tasks when you need that extra bit of protection without reducing your productivity or impeding your arm movements. You will need to see other workwear clothing to accompany this bodywarmer to make sure you are fully protected from the elements. 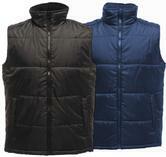 This Classics Bodywarmer from Regatta is thermo-guard insulated for added warmth, Lightweight Polyester with WR finish. Ideal Bodywarmer for all environments, features of this garment include a scrim lined collar, inside pocket, two front pockets. Regatta TRA808 Classic Insulated Body Warmer with full length zip and branding on back of collar. The Regatta Asgard is very warm fleece ideal for those dry environments where a standard fleece just doesn't quite work. This workwear fleece is tough and durable with anti-pilling fabric so it won't bobble anywhere near a lot of fleece garments. The Asgard is a fleece however which means the fabric is limited in its robustness is certain environments and can actually hinder performance especially in the wet. The Dickies Polo Shirt is a classic polo made with a hardwearing polycotton mix. 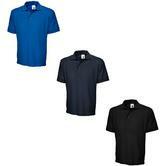 Three button placket Bottle Green polo shirt. The jersey fabric is a 200gsm 65% polyester 35% cotton. Lightweight and durable, its idea for working in warm weather. Made using Uneek 50% polyester 50% cotton reactive dyed sweatshirt. Lycra Ribbed Cuffs, Welt & Neck with Set in Sleeve. Twin Needle Stitching and bushed Effect for Comfort & Style. Designed to maximize comfort and user appeal. Scott Safety First Base, safety baseball cap is the result of over five years product development. Safety with Style - designed to provide the wearer with bump protection. Its a bump cap that people will want to wear. The First Base cap protects the wearer from the sun as well as the occasional bump or scrape. Closed cell soft foam pad, with wide and absorbent terry towelling sweatband. Size adjustment allows one size to fit most people. Patented flexible shell design, manufactured from durable ABS plastic. Lightweight internal moulded/padded shell with foam insert for extra comfort. Enhanced ventilation reduces heat stress and improves comfort. Unique semi-elastic size adjustment improves the security of the cap on the head. Scott Safety Hc22 Bump Cap certified to EN 812 standard. 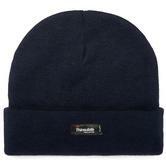 Very comfortable, stylish and warm Fine knitted beanie hat. Perfect in keeping you warm and looking good this cold winter. Thinsulate lining for extra warmth. Suitable for Men's or Women's. The Uvex X-Trend 9177 features a lightweight wrap around style. 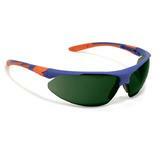 It has straight arms with extra ventilation, no metal parts, and a 20% larger lens for extra protection. Conforms to EN166 Safety Standards. Multi-Purpose glove with a Seamless Mixed Fibre shell. Natural rubber coated Palm and Fingers with a Knitted base. Design allows air passage and reduces perspiration levels also simultaneously increasing comfort. 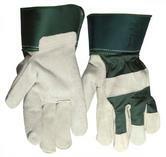 The combination of materials allows this glove to maintain grip in wet or dry conditions. The material used protects the users hands in wet environments or against aggressive detergents and alcohols. Latex coated knuckles providing extended protection to the users hands. Breathable back hand prevents odour from building up. 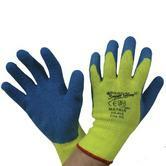 Showa 305 Blue Grip Latex Coated Gloves conforms to EN 388 2.1.4.2. safety gloves standards. Ideal for building sites, general work, or mechanical handling. The gloves are made of quality split leather and canvas on the back of the hand to allow breathability and prevent heat build-up. Tough and durable, offer protection against mechanical hazards and a discrete level of grip. Conform to: EN 388 3.1.3.3 Safety Standards. All-round ox split chrome leather glove with reinforcement on index finger. Half lined and good durability. Suitable for dry work, light heat and lumber work. 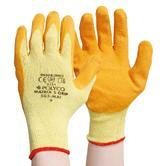 Wenaas 6-6480 Ontario Work Gloves conforms to: EN388 3.1.1.3., EN420, Cat 2 standards. Available in size 6 -XS only. The Polyco Matrix Hi-Viz thermal gloves is a general handling glove with a thermal high visibility liner and a crinkle latex palm coating. Good abrasion and cut resistance, and a maximum EN 300 score of tear resistance. 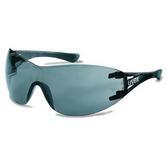 Hi-Viz not only provides good all round protection but is also very durable. 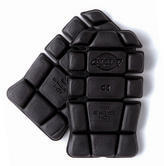 The crinkle latex palm coating offers excellent grip in both wet and dry conditions. Polyco Matrix Warm Lining Latex Palm Coat Hi-Viz Grip Work Glove conform to: EN388 2.2.4.1. standards. North Sea Workwear sells the gardening workwear from the best brands such as Ansell, Blackrock, Dickies, Dunlop and many others. Our range of gardening clothes includes: Gloves, Glasses, Shirts, Trousers, kneepads and Wellies. 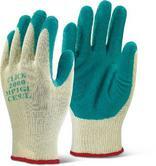 Our hand selected gardening gloves are ideal for any gardener. Manufactured with durable long lasting materials making these ideal for gardening. 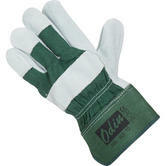 Every glove has a coated palm for improved grip which is useful in both wet and dry conditions. The Showa 305 is a good example, this glove has a flexible design and is resistant to abrasion & penetration. Gardeners spend a lot of time working on their knees which can lead to knee damage. To avoid this we supply a range of knee pads along with kneepad trousers. The BBKP03 beeswift kneepad provides maximum protection to the users knees prolonging knee strain. These kneepads fit well with the Snickers 3212 trousers. During poor weather conditions you can equip yourself with wellies to keep your feet nice and dry. Dunlop are the top wellington manufacturers, these well-crafted wellies are manufactured with high quality materials extending product life. The Dunlop 380VP is designed for comfort, this ergonomically designed wellington has a shock absorbent heel and is thermally insulated for as low as -20°C. Not what you're looking for? Then why not check out our entire Catalogue!